The State joined the Confederate States of America during the American Civil War although much of the eastern part of Tennessee remained pro-Union (about 30,000 Tennessee men fought for the Union) and the sate was the first to return to the Union after the war had ended. Between 1866 and 1955, Tennessee enacted 20 Jim Crow laws discriminating against non-White citizens. the last of which prohibited cross-race marriage. These laws were challenged in the 1960s by Tennessee African-Americans who initiated public demonstrations to challenge racial segregation. As part of the New Deal following the Great Depression, the Tennessee Valley Authority was established in 1933 to produce hydro-electricity by harnessing the energy of the Tennessee River. This made Tennessee the largest public utility supplier in the United States. The state's capital city is Nashville, a major center for country music, and is known unofficially as "Music City." 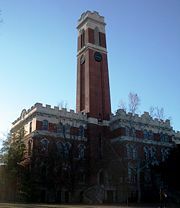 Nashville's private Vanderbilt University is regarded as being among the country's top schools. Protestant clergy were among the state's pioneers in "nurturing education" while the volunteer spirit contributed to the growth of a strong tradition of local democracy. Tennessee produced three United States Presidents and "the Secretary of State who won a Nobel Peace Prize for his leadership in creating the United Nations, Cordell Hull. The earliest variant of the name that became Tennessee was recorded by Captain Juan Pardo, the Spanish explorer, when he and his men passed through a Native American village named "Tanasqui" in 1567 while traveling inland from South Carolina. European settlers later encountered a Cherokee town named Tanasi (or "Tanase") in present-day Monroe County. The town was located on a river of the same name (now known as the Little Tennessee River). It is not known whether this was the same town as the one encountered by Juan Pardo. The meaning and origin of the word are uncertain. Some accounts suggest it is a Cherokee modification of an earlier Yuchi word. It has been said to mean "meeting place," "winding river," or "river of the great bend." According to James Mooney, the name "can not be analyzed" and its meaning is lost. The modern spelling, Tennessee, is attributed to James Glen, the governor of South Carolina, who used this spelling in his official correspondence during the 1750s. In 1788, North Carolina created "Tennessee County," the third county to be established in what is now Middle Tennessee. When a constitutional convention met in 1796 to organize a new state out of the Southwest Territory, it adopted "Tennessee" as the name of the state. 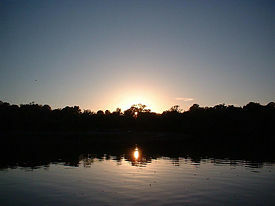 Sunset behind the trees at Bledsoe Creek state park in Tennessee, 2004. Shady Valley, in northeasternmost Tennessee, 2005. 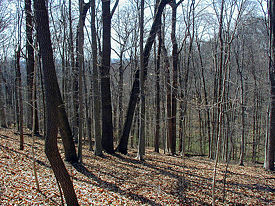 Woods outside Kingsport, Tennessee, 2004. 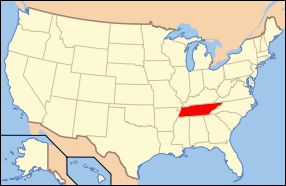 Tennessee lies adjacent to eight other states: Kentucky and Virginia to the north; North Carolina to the east; Georgia, Alabama and Mississippi on the south; and Arkansas and Missouri on the Mississippi River to the west. Tennessee ties Missouri as the states bordering the most other states. The state is trisected by the Tennessee River. The highest point in the state is the peak of Clingmans Dome at 6,643 feet (2,025 m), which lies on Tennessee's eastern border, and is the highest point on the Appalachian Trail. The lowest point is the Mississippi River at the Mississippi state line. The geographical center of the state is located in Murfreesboro on Old Lascassas Pike (just down the road from Middle Tennessee State University). It is marked by a roadside monument. The state of Tennessee is geographically and constitutionally divided into three Grand Divisions: East Tennessee, Middle Tennessee, and West Tennessee. Tennessee features six principal physiographic regions: the Blue Ridge, the Appalachian Ridge and Valley Region, the Cumberland Plateau, the Highland Rim, the Nashville Basin, and the Gulf Coastal Plain. 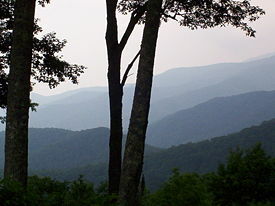 The Blue Ridge area lies on the eastern edge of Tennessee, bordering North Carolina. This region of Tennessee is characterized by high mountains, including the Great Smoky Mountains, the Chilhowee Mountains, the Unicoi Range, and the Iron Mountains range. 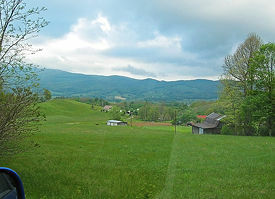 The average elevation of the Blue Ridge area is 5,000 feet (1,500 m) above sea level. Clingman's Dome is located in this region. Stretching west from the Blue Ridge for approximately 55 miles (88 km) is the Ridge and Valley region, in which numerous tributaries join to form the Tennessee River in the Tennessee Valley. This area of Tennessee is covered by fertile valleys separated by wooded ridges, such as Bays Mountain and Clinch Mountain. The western section of the Tennessee valley, where the depressions become broader and the ridges become lower, is called the Great Valley. In this valley are numerous towns and the region's two urban areas, Knoxville, and Chattanooga. To the west of East Tennessee lies the Cumberland Plateau. This area is covered with flat-topped mountains separated by sharp valleys. The elevation of the Cumberland Plateau ranges from 1,500 to 1,800 feet (450 to 550 m) above sea level. West of the Cumberland Plateau is the Highland Rim, an elevated plain that surrounds the Nashville Basin. The northern section of the Highland Rim, known for its high tobacco production, is sometimes called the Pennyroyal Plateau and is located in primarily in Southwestern Kentucky. The Nashville Basin is characterized by rich, fertile farm country and high natural wildlife diversity. Many biologists study the area's salamander species because the diversity is greater there than anywhere else in the U.S. This is thought to be because of the clean Appalachian foothill springs that abound in the area. Most of the state has a humid subtropical climate, with the exception of the higher mountains, which have a humid continental climate. The Gulf of Mexico is the dominant factor in the climate of Tennessee, with winds from the south being responsible for most of the state's annual precipitation. Generally, the state has hot summers and mild to cool winters with generous precipitation throughout the year. On average the state receives 50 inches (130 cm) of precipitation annually. Snowfall ranges from 5 inches (13 cm) in West Tennessee to over 16 inches (41 cm) in the higher mountains in East Tennessee. Summers in the state are generally hot, with most of the state averaging a high of around 90 °F (32 °C) during the summer months. Summer nights tend to be cooler in East Tennessee. Winters tend to be mild to cool, increasing in coolness at higher elevations and in the east. Generally, for areas outside the highest mountains, the average overnight lows are near freezing for most of the state. While the state is far enough from the coast to avoid any direct impact from a hurricane, the location of the state makes it likely to be impacted from the remnants of tropical cyclones which weaken over land and can cause significant rainfall. The state averages around 50 days of thunderstorms per year, some of which can be quite severe. Tornadoes are possible throughout the state, with West Tennessee slightly more vulnerable. On average, the state has 15 tornadoes per year. Tornadoes in Tennessee can be severe, and Tennessee leads the nation in the percentage of total tornadoes which have fatalities. Winter storms are an occasional problem—made worse by a lack of snow removal equipment and a population which might not be accustomed or equipped to travel in snow—although ice storms are a more likely occurrence. Fog is a persistent problem in parts of the state, especially in much of the Great Smoky Mountains. When Spanish explorers first visited the area, led by Hernando de Soto in 1539–43, it was inhabited by tribes of Muscogee and Yuchi people. Possibly because of European diseases devastating the Native tribes, which would have left a population vacuum, and also from expanding European settlement in the north, the Cherokee moved south from the area now called Virginia. As European colonists spread into the area, the native populations were forcibly displaced to the south and west, including all Muscogee and Yuchi peoples, the Chickasaw, and Choctaw. Early during the American Revolutionary War, Fort Watauga at Sycamore Shoals (in present day Elizabethton) was attacked in 1776 by Dragging Canoe and his warring faction of Cherokee (also referred to by settlers as the Chickamauga) opposed to the Transylvania Purchase and aligned with the British Loyalists. The lives of many settlers were spared through the warnings of Dragging Canoe's cousin Nancy Ward. The frontier fort on the banks of the Watauga River later served as a 1780 staging area for the Overmountain Men in preparation to trek over the Great Smoky Mountains, to engage, and to later defeat the British Army at the Battle of Kings Mountain in North Carolina. Eight counties of western North Carolina (and now part of Tennessee) broke off from that state in the late 1780s and formed the abortive State of Franklin. Efforts to obtain admission to the Union failed, and the counties had re-joined North Carolina by 1790. North Carolina ceded the area to the federal government in 1790, after which it was organized into the Southwest Territory. In an effort to encourage settlers to move west into the new territory of Tennessee, in 1787 the mother state of North Carolina ordered a road to be cut to take settlers into the Cumberland Settlements—from the south end of Clinch Mountain (in East Tennessee) to French Lick (Nashville). The Trace was called the “North Carolina Road” or “Avery’s Trace,” and sometimes “The Wilderness Road.” It should not be confused with Daniel Boone's road through Cumberland Gap. Tennessee was admitted to the Union in 1796 as the 16th state. The state boundaries, according to the Constitution of the State of Tennessee, Article I, Section 31, stated that the beginning point for identifying the boundary was the extreme height of the Stone Mountain, at the place where the line of Virginia intersects it, and basically ran the extreme heights of mountain chains through the Appalachian Mountains separating North Carolina from Tennessee past the Indian towns of Cowee and Old Chota, thence along the main ridge of the said mountain (Unicoi Mountain) to the southern boundary of the state; all the territory, lands and waters lying west of said line are included in the boundaries and limits of the newly formed state of Tennessee. Part of the provision also stated that the limits and jurisdiction of the state would include future land acquisition, referencing possible land trade with other states, or the acquisition of territory from west of the Mississippi River. The word "Tennessee" comes from the Cherokee town Tanasi, which along with its neighbor town Chota was one of the most important Cherokee towns and often referred to as the capital city of the Overhill Cherokee. The meaning of the word "tanasi" is lost (Mooney, 1900). Some believe that Tanasi may mean "River with a big bend," referring to the Tennessee River, or that the word Tanasi may have meant "gathering place," as a reference to government or worship for the Native American tribes pre-existent to the pioneer era. During the administration of U.S. President Martin Van Buren, nearly 17,000 Cherokees were uprooted from their homes between 1838 and 1839 and were forced by the U.S. military to march from "emigration depots" in Eastern Tennessee (such as Fort Cass) toward the more distant Indian Territory west of Arkansas. During this relocation an estimated 4,000 Cherokees died along the way west. In the Cherokee language, the event is called Nunna daul Isunyi—"the Trail Where We Cried." 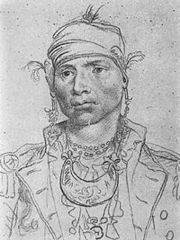 The Cherokees were not the only Native Americans forced to emigrate as a result of the Indian Removal efforts of the United States, and so the phrase "Trail of Tears" is sometimes used to refer to similar events endured by other Native American peoples, especially among the "Five Civilized Tribes." The phrase originated as a description of the earlier emigration of the Choctaw nation. Many major battles of the American Civil War were fought in Tennessee—most of them Union victories. It was the last border state to secede from the Union when it joined the Confederate States of America on June 8, 1861. Ulysses S. Grant and the U.S. Navy captured control of the Cumberland and Tennessee rivers in February 1862. They held off the Confederate counterattack at Shiloh in April. Memphis fell to the Union in June, following a naval battle on the Mississippi River in front of the city. Capture of Memphis and Nashville gave the Union control of the western and middle sections; this control was confirmed at the battle of Murfreesboro in early January 1863. The Confederates held East Tennessee despite the strength of Unionist sentiment there, with the exception of extremely pro-Confederate Sullivan County. The Confederates besieged Chattanooga in early fall 1863, but were driven off by Grant in November. Many of the Confederate defeats can be attributed to the poor strategic vision of General Braxton Bragg, who led the Army of Tennessee from Perryville, KY to Confederate defeat at Chattanooga. The last major battles came when the Confederates invaded Middle Tennessee in November 1864 and were checked at Franklin, then totally destroyed by George Thomas at Nashville, in December. Meanwhile Andrew Johnson, a civilian, was appointed military governor by President Abraham Lincoln. Tennessee was already mostly held by Union forces when the Emancipation Proclamation was announced, hence it was not among the states enumerated in the Proclamation, and the Proclamation did not free any slaves there. Tennessee's legislature approved an amendment to the state constitution prohibiting slavery on February 22, 1865. Voters in the state approved the amendment in March. It also ratified the Thirteenth Amendment to the United States Constitution (abolishing slavery in every state) on April 7, 1865. 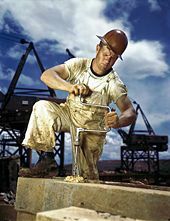 Carpenter at work during the 1942 construction of the Douglas Dam in East Tennessee. Andrew Johnson (a War Democrat from Tennessee) had been elected Vice President with Abraham Lincoln in 1864 and became President after Lincoln's assassination in 1865. Under Johnson's lenient re-admission policy, Tennessee was the first of the seceding states to have its elected members readmitted to the U.S. Congress, on July 24, 1866. Because Tennessee had ratified the Fourteenth Amendment, it was the only one of the formerly seceded states that did not have a military governor during the Reconstruction period. In 1897, the state celebrated its centennial of statehood (though one year late of the 1896 anniversary) with a great exposition in Nashville. A full scale replica of the Parthenon was constructed for the celebration, located in what is now Nashville's Centennial Park. On August 18, 1920, Tennessee became the thirty-sixth and final state necessary to ratify the Nineteenth Amendment to the United States Constitution, which provided women the right to vote. The need to create work for the unemployed during the Great Depression, a desire for rural electrification, the need to control annual spring floodings and improve shipping capacity on the Tennessee River were all factors that drove the Federal creation of the Tennessee Valley Authority (TVA) in 1933. Through the power of the TVA projects, Tennessee quickly became the nation's largest public utility supplier. Tennessee celebrated its bicentennial in 1996. With a yearlong statewide celebration entitled "Tennessee 200," it opened a new state park (Bicentennial Mall) at the foot of Capitol Hill in Nashville. Nashville is the capital of Tennessee. It is the second most populous city in the state after Memphis, although its Metropolitan Statistical Area population exceeds that of Memphis. It is located on the Cumberland River in Davidson County, in the north-central part of the state. Nashville is a major hub for the health care, music, publishing, banking and transportation industries. Nashville was founded by James Robertson and a party of Wataugans in 1779, and was originally called Fort Nashborough, after the American Revolutionary War hero Francis Nash. Nashville quickly grew because of its prime location, accessibility as a river port, and its later status as a major railroad center. In 1806, Nashville was incorporated as a city and became the county seat of Davidson County. In 1843, the city was named the permanent capital of the state of Tennessee. Tennessee's governor holds office for a four-year term and may serve a maximum of two terms. The governor is the only official who is elected statewide, making him one of the more powerful chief executives in the nation. The state does not elect the lieutenant-governor directly, contrary to most other states; the Tennessee Senate elects its Speaker who serves as lieutenant governor. The highest court in Tennessee is the state Supreme Court. It has a chief justice and four associate justices. No more than two justices can be from the same Grand Division. The Court of Appeals has 12 judges. The Court of Criminal Appeals has 12 judges. Like most Southern states, Tennessee tends to be politically conservative and currently tilts towards the Republican Party. However, it has often prided itself on its more moderate attitudes about matters of economics and race than some states of the Deep South. While the Republicans control slightly more than half of the state, Democrats have strong support in the cities of Memphis and Nashville and in parts of Middle Tennessee (although declining, due to the growth of suburban Nashville) and West Tennessee north of Memphis, where a large rural African-American population resides. In the decades following the Civil Rights Movement and a concomitant revulsion against cultural liberalism, the Republicans have gained strength in the conservative suburbs of Memphis and Nashville and increasing support among rural voters elsewhere in West and Middle Tennessee (especially the former Grand Division). These patterns are largely in keeping with the South generally and do not generally reflect local idiosyncrasies. Tennessee sends nine members to the US House of Representatives, currently consisting of five Democrats and four Republicans. The Baker v. Carr decision of the US Supreme Court (1962), which established the principle of one man, one vote was based on a lawsuit over rural-biased malapportionment in the Tennessee legislature. The ruling led to an increased prominence in state politics by urban and, eventually, suburban, legislators and statewide officeholders. Major outputs for the state include textiles, cotton, cattle, and electrical power. Tennessee has over 82,000 farms, with beef cattle found in roughly 59 percent of the farms in the state. Although cotton was an early crop in Tennessee, large-scale cultivation of the fiber did not begin until the 1820s with the opening of the land between the Tennessee and Mississippi Rivers. The upper wedge of the Mississippi Delta extends into southwestern Tennessee, and it was in this fertile section that cotton took hold. Currently West Tennessee is also heavily planted in soybeans, mainly in the northwest corner of the state. Major corporations with headquarters in Tennessee include FedEx Corporation, AutoZone Incorporated and International Paper, all based in Memphis. Tennessee is a right to work state, as are most of its Southern neighbors. Unionization has historically been low and continues to decline as in most of the U.S. generally. The Tennessee income tax does not apply to salaries and wages, but most income from stocks, bonds and notes receivable is taxable. The state charges sales and use taxes, and most jurisdictions collect a local sales tax as well. In 2007 the total sales tax rate varied between 8.5 percent and 9.75 percent, one of the highest levels in the nation. Interstate 40 crosses the state in an east-west orientation. Its branch interstate highways include I-240 in Memphis; I-440 and I-840 in Nashville; and I-140 and I-640 in Knoxville. I-26, although technically an east-west interstate, runs from the North Carolina border below Johnson City to its terminus at Kingsport. I-24 is the other east-west interstate crossing Tennessee. In a north-south orientation are highways I-55, I-65, I-75, and I-81. Interstate 65 crosses the state through Nashville, while Interstate 75 serves Knoxville and Interstate 55 serves Memphis. Interstate 81 enters the state at Bristol and terminates at its junction with I-40 near Jefferson City. I-155 is a branch highway from I-55. Major airports within the state include Nashville International Airport (BNA), Memphis International Airport (MEM), McGhee Tyson Airport (TYS) in Knoxville, Chattanooga Metropolitan Airport (CHA), and Tri-Cities Regional Airport (TRI). Because Memphis International Airport is the major hub for FedEx Corporation, it is the world's largest air cargo operation. Memphis is served by the famed Amtrak train, the City of New Orleans on its run between Chicago, Illinois and New Orleans, Louisiana. The City of New Orleans also stops near Dyersburg, Tennessee. 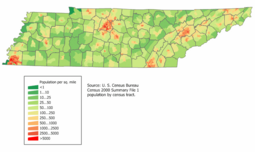 The center of population of Tennessee is located in Rutherford County, in the city of Murfreesboro. 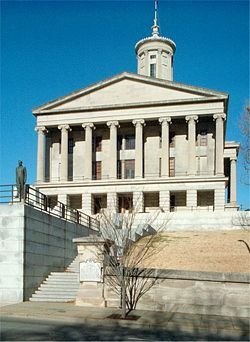 The capital is Nashville, though Knoxville, Kingston, and Murfreesboro have all served as state capitals in the past. 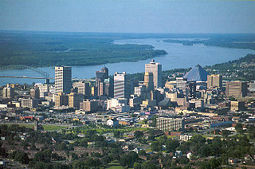 Memphis has the largest population of any city in the state, but Nashville has had the state's largest metropolitan area since 1990; Memphis formerly held that title. Chattanooga and Knoxville, both in the eastern part of the state near the Great Smoky Mountains, each has approximately a third of the population of Memphis or Nashville. The city of Clarksville is the fifth significant population center, some 45 miles (70 km) northwest of Nashville. According to the U.S. Census Bureau, as of 2006, Tennessee had an estimated population of 6,038,803, which was an increase of 83,058, or 1.4 percent, from the prior year and an increase of 349,541, or 6.1 percent, since the year 2000. This includes a natural increase since the last census of 142,266 people (that is 493,881 births minus 351,615 deaths) and an increase from net migration of 219,551 people into the state. Immigration from outside the United States resulted in a net increase of 59,385 people, and migration within the country produced a net increase of 160,166 people. In 2000, the five most common self-reported ethnic groups in the state were: American (17.3 percent), African American (16.4 percent), Irish (9.3 percent), English (9.1 percent), and German (8.3 percent). The state's African-American population is concentrated mainly in rural West and Middle Tennessee and the cities of Memphis, Nashville, Clarksville, Chattanooga, and Knoxville. Memphis has the largest percentage of African-American residents for any metropolitan area in the U.S.
Tennessee's population is predominately Christian (82 percent), with 39 percent of the population belonging to the Baptist Church while 10 percent are Methodist. Only 6 percent claim Roman Catholic membership. Other denominations have significantly smaller membership numbers. The percent belong to "other religions." The Southern Baptist Convention maintains its general headquarters in Nashville, where its Sunday School Board is also located, as are publishing houses of several other denominations. The state's small Roman Catholic and Jewish communities are mainly centered in the metropolitan areas of Memphis, Nashville, and Knoxville. ↑ Tennessee State Library and Archives, Brief History of Tennessee in the War of 1812, Brief History of Tennessee in the War of 1812 Retrieved April 30, 2006. ↑ The Civil War and Reconstruction information from The Columbia Encyclopedia, Sixth Edition. 2001-07. Retrieved December 13, 2007. ↑ Tennessee State Library and Archives, FAQ, What is the meaning of the name "Tennessee" Retrieved December 13, 2007. ↑ Dallas Bogan, Tennessee's Name Dates Back to 1567 Spanish Explorer Captain Juan Pardoh, TN Gen Web - History of Campbell County Tennessee Retrieved December 13, 2007. ↑ James Mooney. Myths of the Cherokee. (New York: Dover,  1995), 534. ↑ Agclassroom, A look at Tennessee Agriculture, A look at Tennessee Agriculture Retrieved November 1, 2006. ↑ National Weather Service, Thunderstorm Hazards, US Thunderstorm distribution Retrieved November 1, 2006. ↑ NOAA Satellite and Information Service, Annual Average Number of Tornadoes 1953-2004. Annual Average Number of Tornadoes 1953-2004 Retrieved November 1, 2006. ↑ Tornado Project, Top Ten Tornado Lists, Top Tens List Retrieved November 1, 2006. ↑ Ronald Satz. Tennessee's Indian Peoples. (Knoxille: University of Tennessee Press, 1979). ↑ University of Maryland - Department of History, Chronology of Emancipation during the Civil War, Chronology of Emancipation during the Civil War Retrieved December 13, 2007. ↑ Tennessee State Library and Archives, This Honorable Body: African American Legislators in 19th Century Tennessee. Timeline Retrieved December 13, 2007. ↑ Tennessee Administrative Office of the Courts, Court of Criminal Appeals, Court of Criminal Appeals Retrieved December 13, 2007. ↑ James B. Neel, Tennessee's Cattle Industry, University of Tennessee - Institute of Agriculture - Department of Animal Science Retrieved December 13, 2007. ↑ USDA, 2002 Census of Agriculture, Maps and Cartographic Resources, Index of Maps Retrieved December 13, 2007. ↑ State Board of Education. Board of Education Retrieved March 13, 2008. ↑ Census Bureau, Ancestry: 2000, Census 2000 Brief Retrieved December 13, 2007. Agclassroom. A look at Tennessee Agriculture. A look at Tennessee Agriculture Retrieved November 1, 2006. BBC News. "Tennessee bans lethal injection." Tennessee bans lethal injection Retrieved December 13, 2007. Bogan, Dallas. Tennessee's Name Dates Back to 1567 Spanish Explorer Captain Juan Pardoh. TN Gen Web - History of Cambell County Tennessee Retrieved December 13, 2007. Bontemps, Arna. William C. Handy: Father of the Blues: An Autobiography. New York: Macmillan Company, 1941. Brownlow, W. G. Sketches of the Rise, Progress, and Decline of Secession: With a Narrative of Personal Adventures among the Rebels. George W. Childs, 1862. Census Bureau. Ancestry: 2000. Census 2000 Brief Retrieved December 13, 2007. Census Bureau. Population and Population Centers by State: 2000. Population and Population Centers: 2000 Retrieved December 13, 2007. The Graduate Center, CUNY. American Religious Identification Survey. American Religious Identification Survey Retrieved December 13, 2007. Mooney, James. Myths of the Cherokee. New York: Dover,  1995. National Weather Service. Thunderstorm Hazards. US Thunderstorm distribution Retrieved November 1, 2006. Neel, James B. Tennessee's Cattle Industry. University of Tennessee - Institue of Agriculture - Department of Animal Science Retrieved December 13, 2007. NOAA Satellite and Information Service. Annual Average Number of Tornadoes 1953-2004. Annual Average Number of Tornadoes 1953-2004 Retrieved November 1, 2006. Tennessee Administrative Office of the Courts. Court of Criminal Appeals. Court of Criminal Appeals Retrieved December 13, 2007. Tennessee State Library and Archives. Brief History of Tennessee in the War of 1812. Brief History of Tennessee in the War of 1812 Retrieved April 30, 2006. Tennessee State Library and Archives. FAQ. What is the meaning of the name "Tennessee" Retrieved December 13, 2007. Tennessee State Library and Archives. A Guide to Tennessee Estate and Inheritence Taxes. Inheritence Tax Retrieved December 13, 2007. Tennessee State Library and Archives. This Honorable Body: African American Legislators in 19th Century Tennessee. Timeline Retrieved December 13, 2007. Tornado Project. Top Ten Tornado Lists. Top Tens List Retrieved November 1, 2006. University of Maryland - Department of History. Chronology of Emancipation during the Civil War. Chronology of Emancipation during the Civil War Retrieved December 13, 2007. USDA. 2002 Census of Agriculture, Maps and Cartographic Resources. Index of Maps Retrieved December 13, 2007. U.S Geological Survey. 'Elevations and Distances in the United States. Geographic Centers Retrieved November 7, 2006. U.S. Travel Weather. Tennessee Weather. Tennessee Weather and Climate Retrieved December 13, 2007. Van West, Carroll, ed. The Tennessee Encyclopedia of History and Culture. Nashville: Routledge Hill Press, 1998 ISBN 9781558535992 The Tennessee Encyclopedia of History and Culture Retrieved December 13, 2007. The Annals of Tennessee to the End of the Eighteenth Century - a history by J. G. M. Ramsey, 1853. This page was last modified on 19 November 2015, at 15:42.